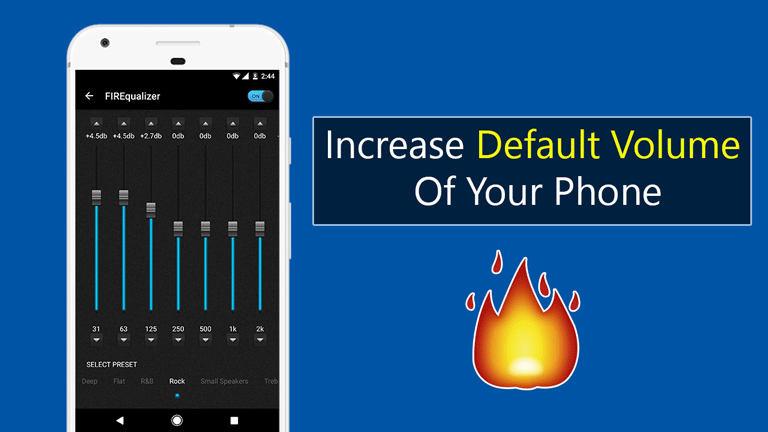 Hey, they’re welcome back today in this article I will share a trick with you on How To Increase Default Volume Of Your Phone. Many of you might be facing this problem with your smartphone. So, this method to Increase Default Volume Of Your Phone will definitely help you out. At your phone many times you might think that at full volume the sound is not sufficient. It happens too often with me, anyhow volume is very important for our phones basically while consuming media. So, today I will share some awesome tips and tricks with you to increase your phone volume by 80%. I will be sharing with you some of the apps that will definitely help you out to enhance your phone volume. I have personally picked these apps and they are completely free to use. By the end of this article, I am sure you will be able to Increase Default Volume Of Your Phone. Enhance Your Phone Default Volume For Better Experience! This app will boost your phone’s default volume up to 60%. This app will make your movies & audio experience better than before. Volume booster works on almost every android devices (works on Android version 4.4 or higher ). You will be getting two sliders one is for the volume and one for boost. Once you boost your volume up to 60% then the volume will become too much noisy. So, it is better to boost up to 40%-45%. You can try on your phone and adjust accordingly. However, you will find some ads but it will not affect your phone experience. This app is similar to the first app. But it has some extra features, this will increase your volume up to 50-60%. Now you might be confused which is better and what’s the difference. The main highlight of this app is that it has No Ads. Completely ads free experience. On talking about settings, you can adjust volume by going to this app settings. Some amazing features of this app: Boost On Startup, you can set the Maximum Boost Allowed according to your choice. And also I personally like the interface of the app. You are getting equalizers effect which looks cool to see. This app is totally different from the above apps. You can set playlist in this app which is the new feature. You are also getting Equalizer Control, you can equalize any audio according to your need. Like you can control bass, treble, also you can control your background sounds. Completely free to use must try it! Top features of this app: No Root Required, Limit volume and protect your hearing, Tons of settings, Custom Volume Presets, Automate everything, Fully-Featured Equalizer, Bass Booster, Volume Booster, Lock Volume Buttons to Media, Dark App/UI Theme, Combine All Volumes & Much Much More! Black Player is a free music player, this app looks amazing. I personally like this app because of its minimalistic Material UI Design. This app gives you by default volume booster to increase your phone’s default volume. You will see amazing animations while playing music. Highly customizable, smooth and snappy experience. You can edit Tracks, Albums, Artists & Genres. This app supports Android Auto and Wear OS. It has powerful equalizer which none of the apps gives. Top features of this app: Supports standard local music player files such as MP3, WAV, OGG, FLAC, M4A, 5 Band Equalizer, BassBoost, 3D Surround Virtualizer, and Amplifier. You can also use your external Equalizer for best audio quality, Gapless audio playback, View & Edit embedded lyrics, supports synchronized .lrc files. Equalizer pro boosts your phone’s default volume with clear sound, You are getting the powerful equalizer with Bass booster, Volume booster, and 3D Virtualizer effects. It has a music library so, simply you have to open the app and enjoy your music. It has Five bands equalizer with various features. This app has Bass Boost music effect which will increase your phone’s volume up to 55% with clear sound effect. Here, are some top features of this app. This app has 3D Surround Sound, you can Turn off and turn on equalizer effect, Browse and play all music with equalizer, and much more! Final Words: So, this is all about How To Increase Default Volume Of Your Phone. I hope this article helps you to increase your phone’s default volume. If you want to ask any questions related to this article then make sure to comment down below. We would love to hear from you.